Sipping in hot chamomile tea in chilly winters is all that makes the day sorted. But do you know except the great taste of chamomile tea, it has many benefits for hair, skin and overall health, yes! You heard it right. And to make you all aware, here we have listed some amazing health benefits of drinking chamomile tea. Here have a look to know! Consuming chamomile tea contains antibacterial properties that help to treat cough and cold. It also helps to protect ourselves from bacteria-related illness and infection. And as it protects you from various microbes, thus it helps to boost immunity. Drinking chamomile tea helps to reduce weight and bloating as it is loaded with nutrients like potassium, flavonoids and calcium. 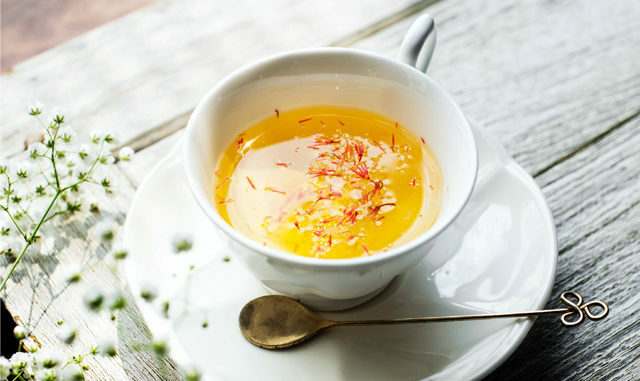 Also, there are some causes like irregular sleep and stress that interrupts the insulin production resulting in weight gain, but here again chamomile tea comes to the rescue as consuming it promotes better sleep and stress-free life. Thus, drinking chamomile tea for weight loss is really beneficial. Lack of sleep is a common problem. But this sleep disorder can be treated by consuming chamomile tea as it contains mild sedating properties that helps to sleep better and faster. So, sip it in on a regular basis and have a good sleep. Chamomile contains anti-inflammatory and antispasmodic properties that are effective enough to treat intestinal and stomach cramps during the menstrual cycle. Drinking chamomile tea on a regular basis helps to reduce bowel problems, stomach flu, gastroenteritis and relieves the body from bloating. Also, it increases the level of glycine in the body that helps to reduce muscle spasms. Keeping wet chamomile tea bags under the eyes on a regular basis helps to reduce puffiness and heals dark circles under the eyes. So, this can be your best way to get rid of those hangout after effects. Cuts and wounds surely pain a lot and having it in long run makes the skin hard and worsens the pain. But as chamomile tea contains healing properties, it accelerates the process of healing wounds, cuts and disinfects them quickly. It has been traditionally used by Egyptians, Romans, Greeks etc to heal wounds when there was no medicine made to heal. Using chamomile water is one proven home remedy to get rid of dandruff and itchiness on the scalp. All you need to do is pour some water in the bucket and dip 3-4 chamomile tea bags in the water and use that water to wash your hair which will help to soothe the scalp and would clear all dandruff. Chamomile tea is a really amazing home remedy to treat rashes and allergies. All you need to do is just dip the cotton balls in chamomile tea and apply it to the allergic area and rashes. Chamomile tea can also be used as a facial scrub that would help to make your skin smooth, fresh and clears out the dry skin cells. All you need to do is just blend the chamomile tea with powdered milk and it is ready to be used as a scrub. Chamomile tea controls diabetes and blood glucose levels, but make sure to consult a doctor to set the right dosage of chamomile tea for your body. So, these were the 10 benefits of drinking chamomile tea for hair, skin and overall health. Sip in the chamomile tea and lead a healthy life.